Michigan winters wreak havoc on all types of flooring but salt does particularly nasty damage to both the appearance and cleanliness of carpeting. Carpeted areas in commercial facilities should ideally be cleaned multiple times each year to maintain cleanliness and help extend its life, but not each carpet service necessarily requires the same type of cleaning. Early spring should be your deep extraction carpet service to remove as much salt and sediment as possible that was tracked in during the winter. Like carpet cleaning, windows should be cleaned multiple times per year. Window washing is always done on a ‘weather permitting’ basis and the cold especially limits what work can be done in late fall and winter. As a result, window washing companies find themselves in high demand in the spring starting in April. If the weather is above freezing, this work can easily be done in late February and March. If you want to hold off until their busy season in April or May, now is the time to call and schedule for those months. 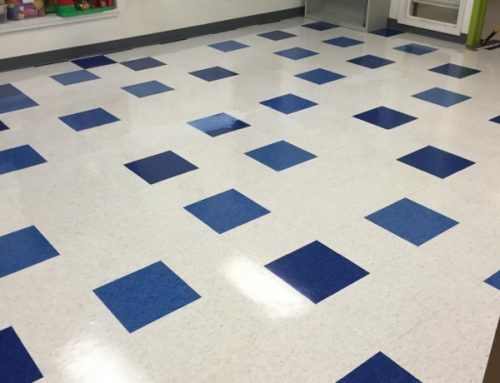 The bonus to resilient floors is that they don’t harbor nearly the same amount of dirt or bacteria that carpet does due to the ability to wash it consistently. Most facilities do not utilize an auto-scrubbing machine on a daily basis which means that despite even daily mopping, there is always some amount of dirt sitting on the floor when the mop water dries on it. Resilient floors typically develop a duller appearance during the winter months due to the excessive salt and ice melters put down outside of buildings. Having resilient floors cleaned using an auto-scrubber machine vacuums up the water put down on a floor after providing a more thorough cleaning via scrubbing brush. Winter is notorious for being cold and flu season and unfortunately it can easily linger into early spring. Opting for deep cleaning services for any facility that provides broader surface sanitization can help to cut illness causing bacteria and improve the health of your work place. These services go deeper than most typical daily janitorial services by wiping down all surfaces including filing cabinets, cupboards, copy machines, all door knobs, light switches and other high contact areas. The schedules of commercial cleaning companies will be filling up quickly once the nice weather truly takes hold. Plan ahead and get on their calendars now to ensure your facility is taken care of in a timely manner once we have said farewell to winter. What other spring cleaning tasks do you have on your to-do list? Have questions about seasonal cleaning services or regular janitorial needs for your Macomb or Oakland County facility? Contact us for more information on-line at www.tedescoservices.com or at 586-997-3337 and think spring!